All papers will have 5-8 pages and will be written following the ACM template provided by ACM (https://www.acm.org/publications/proceedings-template) and should apply ACM Computing Classification categories. The template provides space for this indexing and point authors to the Computing Classification Scheme at: https://www.acm.org/publications/class-2012. 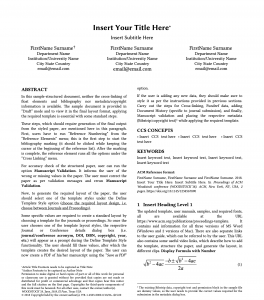 It is mandatory to use the ACM template (download here the example in PDF). We recommend using Word template (Interim Layout) because the camera-ready version must be submitted in PDF and also in .DOC or .DOCX. The first anonymous version must be submitted in PDF. Check deadlines here. To use the ACM template properly you need to download and install the ACM Fonts: download here. Regarding the references style, there are instructions in the following link https://www.acm.org/publications/authors/reference-formatting. If you use a reference manager such Endnote (ACM-TEEM.ens_.zip), Zotero (https://www.zotero.org/styles/acm-sig-proceedings), RefWorks or Mendeley, you can use the reference style for ACM SIG Proceedings. When you are sure your paper meets the formatting requirements please go to the EasyChair platform and create an account if you don’t have one and submit your contribution (https://easychair.org/conferences/?conf=teem19).